Microsoft Office Apps to Get a Facelift: What to Expect? Microsoft Office Apps to Get a Facelift! 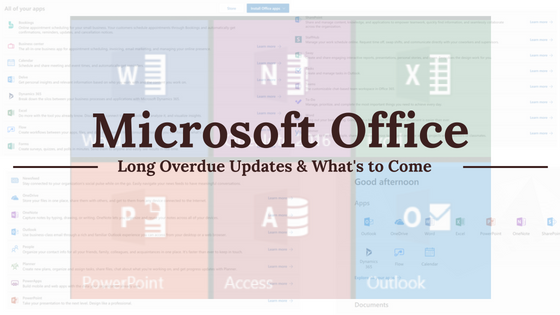 As you may or may not have heard, Microsoft Office is getting a facelift! Yes, it is long overdue and many people have been eagerly waiting for Microsoft to get with the times. Microsoft will finally implement some changes that are due to roll out soon. They recently announced that they will be releasing one of the biggest Office redesigns to date. They are making the apps faster, more collaborative and making the overall look and feel cleaner and simpler. The changes will slowly start to trickle in. The first will be on Outlook and Word. There may even be some users that don’t realize there have been a change right away, but here is what to look for Ribbon simplification, New icons/colors, and a Search feature. Currently, this is what the toolbar looks like (above). We are eager to see what the changes that they release look like. They will be releasing those two updates first and then the rest will follow shortly after. We are excited to see what they come out with, and to see where the future goes with the Microsoft Office Apps. What do you think they will keep? Are you happy about this change as well? Let us know in the comments. As we find out more, we will share it here, so please subscribe to the blog if you haven’t yet, so you can get it conveniently delivered right to your email inbox. Sign up to Receive our Newsletter: For Tech Insights, Reviews, News and more.